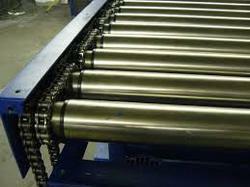 We undertake Material Handling Projects and Systems incorporating Powered Roller Conveyors. The Powered Roller Conveyors are employed in various industrial applications for specialized Material Handling Applications. 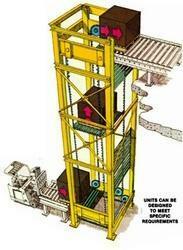 A Vertical Conveyor is a machine which can be used to move products automatically from one level to another. Vertical Reciprocating Conveyors move materials in factories, warehouses, industrial plants, institutions or anywhere that products or supplies need to move from one level to another. 'ertical conveyors are constructed for automated conveying systems and should not be mistaken for freight or passanger elevators. Whizz offers a wide range of Vertical Conveyors according to the customer requirement. These Vertical Conveyor's provide fast, efficient, convenient and safe access to/from mezzanines, balconies, basements, and between levels in multiple story buildings. They can be installed for through-floor, interior or exterior applications. The principal components of Vertical Conveyor include guide columns, carriage and a mechanical or hydraulic actuating mechanism. We scrutinize and address every detail of every job. We carefully analyze your needs, cover all design and construction issues, provide complete code-approved engineered drawings and deliver unmatched, ongoing service support. Whizz has the engineering capabilities, experience and technical know-how to solve a myriad of vertical lifting problems. Whizz has designed Vertical Conveyors to move materials that weigh 10 lbs to over 200,000 lbs, with carriages from 30”x30” to 60’x60’, and vertical heights from 4’ to over 200’. We have built large load work platforms, over-and-under equipment for assembly lines, hopper transfer systems and much more. Whizz custom designs continuous vertical lift conveyors, in either S or C configurations, to meet each customer’s special needs. Our S-conveyors are much more space-efficient than incline conveyors or spiral conveyor systems and can be used for either upward, downward, or both to transport up to 50 items per minute. Like S-conveyors,C-conveyors can be used for transport in either direction but have feed and discharge on the same side.Photoelectric sensors control smooth feed and discharge of goods to and from the conveyor platforms. Whizz vertical conveyor systems are designed to handle anything from lightweight items, such as food trays, to heavy products for pallet loads up to 3,300 lbs (1.5t). For extra heavy pallet loads up to 5,000 lbs, see our selection of heavy load pallet lifters. Choice of pallet platform material: polyester rods covered with plastic tubing and steel or solid aluminum platforms. 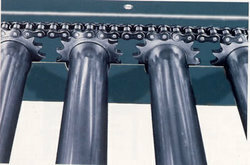 Aluminum, painted steel, or stainless steel profile frames. Prewired sensors and motors; preconnection to terminal boxes. Control panel for the whole system. Less noise and minimum footprint in case of continuous vertical conveyor. Widely used in material handling, packaging, automatic distribution and warehousing applications.various industries such as heavy industry, food and beverage, processing, and elevators industries to move packaged goods, assemblies, process byproducts or materials for short distances. Employed in airports, construction, mines, cement plants, distribution facilities, and agricultural as well as in general purpose applications like grocery shops, treadmills, turntables and check weighers. A process Automated Conveyor System (PAS) is used to automatically control a process. The PAS often uses a network to interconnect sensors, controllers, operator terminals and actuators. 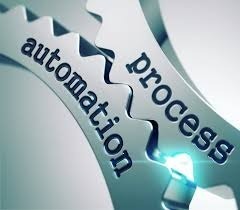 Process automation involves using computer technology and software engineering to operate more efficiently and safely. 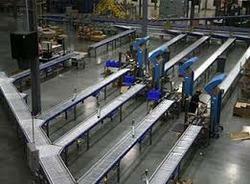 We undertake all types of Process Automation Projects for conveyors. By integrating all the unit operations with DCS we are able to offer turnkey solution for New Projects or for Existing Plants for improving productivity and efficiency. We undertake all types of Process Automation Systems for various Industries. Pallet Handling Systems supplied by us are used in storage systems or warehouses where the goods are usually handled on pallets, in containers or as a different type of unit load. Pallet Handling Systems includes all logistic equipment used to process the goods including conveyors, stacker cranes, picking stations, palletizers, and packing & labelling machines, etc. Also the system capacity and functionality are determined and simulated to verify that the system possesses the right properties. 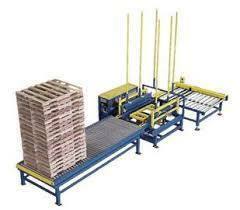 We offer solutions for all kinds of Automated Material Handling System within the warehouse and logistic area. This ensures that the required functionalities are met for the handling of materials, as well as finished products and pallets. The design of automatic storage and warehouse systems is determined by parameters identified in project analysis and specification stage. The analysis establishes guidelines for the design of the solutions both from technical and operational perspectives. · A material-handling system can be simply defined as an integrated system involving such activities as handling, storing, and controlling of materials. · The word material has very broad meaning, covering all kinds of raw materials, work in process, subassemblies, and finished assemblies. · The primary objective of using a material handling system is to ensure that the material in the right amount is safely delivered to the desired destination at the right time and at minimum cost. The material handling system is properly designed not only to ensure the minimum cost and compatibility with other manufacturing equipment but also to meet safety concerns. Material handling is the movement and storage of material at the lowest possible cost through the use of proper method and equipment. Looking for Industrial Automation Material Handling ?